With great anticipation every year New Yorkers and tourists alike flock to the sidewalks of 5th ave to see the dazzling window displays that leave you believing in holiday magic. These little boxes of wonder are always a true testament to imagination, creativity and a childlike wonderment hidden in us all. 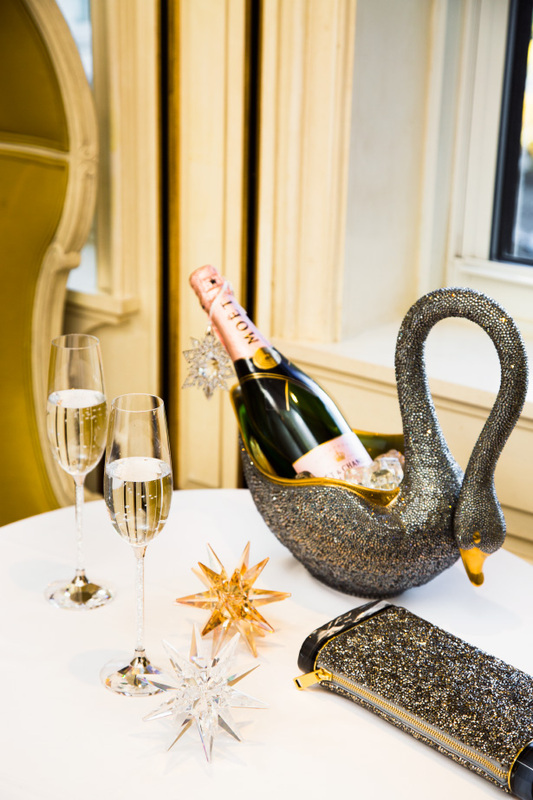 This year Bergdorf Goodman and Swarovski collaborated in their holiday storytelling by incorporating millions of Swarovski crystals into their dazzling display. However! It’s not limited to just the windows. Inside the aspirational fashion dreamland of Bergdorf Goodman more enchantment awaits. Have you ever seen a crystal Christmas tree and a gown to match? Swarovski sparkle is all over the store from the crystal wall curtain to magical hanging bespoke sculptures so brilliant you believe you are living inside a snowflake. The collaboration between the iconic department store overlooking Central Park and Swarovski, the world-renowned crystal company who is celebrating their 120th anniversary, is not limited to display fantasies only! They also partnered with designers to create an exclusive selection of gifts, including couture gowns with crystal embellishment by Badgley Mischka, Naeem Khan and Alexandra Vidal, crystal dress by Tanya Taylor, crystal jumpsuit by Alice + Olivia, crystallized clutches from Atelier Swarovski by Edie Parker, Atelier Swarovski by Arik Levy rock formations and Swarovski covered accessories, ornaments and home décor items from some of the top names in contemporary fashion and design. I love going to Bergdorfs and I had to see it all for myself, to bring the special edition fashion pieces to life with a gorgeous muse and wander around one of the most beautiful stores in the world with everything glittering around me, filling my soul with that special feeling you only find during the holiday season…magic. Above~ Just doing a little holiday party shoe shopping for anything that sparkles in a Swarovski beaded Alexandra Vidal Dress, Swarovski lined Rene Caovilla shoes, & Dannijo Swarovski crystal earrings on Bergdorf’s 2nd floor. Below~ Flipping through Swarovski’s new book by Rizzoli “Celebrating a history of Collaborations in Fashion, Jewelry, Performance and design” while gown shopping amongst the Swarovski Crystal Palace Tulsa candeliers by Michael Anastassiade of Bergdorf’s 3rd floor in a Zac Posen gown. Above and Below~ Taking a shopping break in a Giambattista Valli Top & Skirt, Gianvito Rossi boots, Atelier Swarovski by Edie Parker clutch with Swarovski crystals, & Auden bracelet at Bergdorf Goodman’s restaurant on the 7th floor with Swarovski champagne glasses, Swarovski crystal ornaments, and L’Object with Swarovski crystal swan. Below~ Stopping traffic on 5th ave outside Bergdorf’s holiday windows decked out in millions of Swarovski crystals in a crimson Delpozo Dress, J Mendel Fur, Rene Caovilla Swarovski crystal lined shoes, Atelier Swarovski by Edie Parker Clutch covered in Swarovski crystals & Fendi Sunglasses with Swarovski crystal details. I wish you a dazzling holiday shopping season!